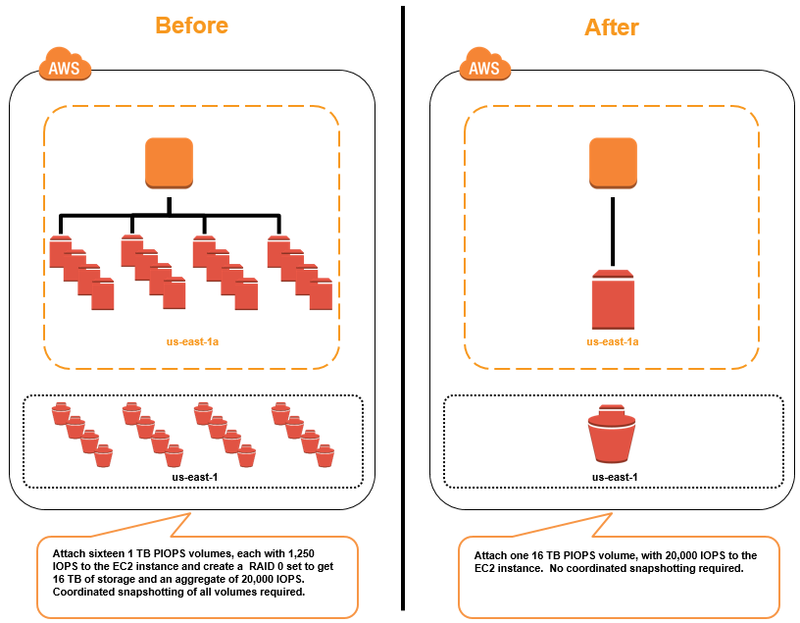 AWS have now made available Provisioned IOPS (SSD) volumes with up to 16 TB and 20,000 IOPS and a maximum throughput of 320 MBps. Before you would need to attach 16 x 1 TB 1250 IOPS volumes to achieve the same performance. General Purpose (SSD) volumes are also now available with up to 16 TB and 10,000 IOPS and a maximum throughput of 160 MBps. General Purpose (SSD) volumes are also now designed to deliver a consistent baseline performance of 3 IOPS/GB to a maximum of 10,000 IOPS, and provide up to 160 MBps of throughput per volume.